The Black Market in Ulaanbaatar is also known as Naraan Tuul. It spreads across a large section of the center of the city on the south western side of Peace Avenue. It is where locals buy everything they need, from electronics to clothing, horse saddles, ropes and blankets, shamanistic ritual props, shoes, furniture for gers, fabrics, cosmetics, carpets, traditional hats and snuff bottles, coins, cashmere, food and much more. The concierge at our hotel was surprised when we told her that we planned to go to the Black Market, and added that they tell their guests that it is not a safe place for tourists, because many pickpockets operate there. We really weren’t at all concerned with its reputation – in fact, we were excited to visit a local market here, since it’s something we try to do everywhere we travel. We walked around the busy, bustling market, taking in the faces of the people, the colors, the crafts, the traditions, and it occurred to me that this was the last day that we will be spending in this fascinating and enchanting country…. The black market is an intriguing place, a real slice of the Mongolian traditional lives of tradesmen. I especially loved the sections selling tack (horse riding supplies), including elaborately decorated saddles, old snuff bottles and shamanistic ritual tools. Mongolian shamans always wear many snakes around their necks. These are not real snakes, but ropes that resemble snakes, made from fabric. I was told that the tradition is that each shaman must wear many, many snakes. The exact number of snakes will be revealed to the shaman either by his teacher, or through a spirit guide who comes to him or her during a trance. There were also necklaces of shamanistic ritual bells, selling for high prices. Apparently, these copper bells need to be large and loud enough, so that the spirit world would hear the ringing sounds and be summoned to help the shamans heal the people or grant their wishes. There were beautiful shamanistic drums, made from the skins of gazelles, with carved wooden drum sticks, called Bumber. I bought one such beautiful drum stick with a carving of a dragon on one side, and a horse head on the other side. 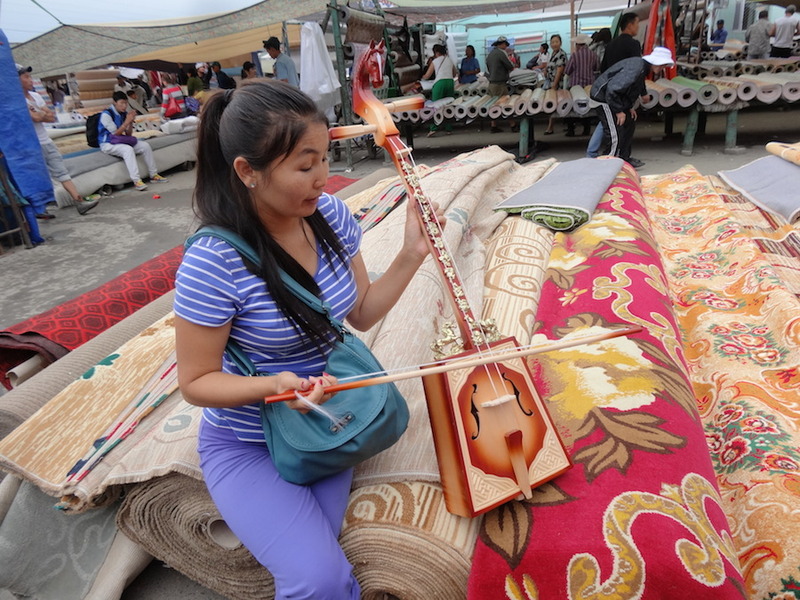 For a strange reason, I felt very drawn to buy a Mongolian horse fiddle, called a Murin-Khuur. This beautiful instrument, which looks like a square fiddle with a carved horse head at the pegs’ end, has only two strings. Yet the sound that this simple horse fiddle makes is hauntingly beautiful. The night before, we had gone to see a traditional Mongolian concert with songs, dances and an amazing contortionist. The sound of the horse fiddle mixed with Mongolian throat singing still vibrated in my heart. I knew that it would be difficult to carry a large musical instrument along with our bags and backpacks, across Tokyo and on the train to Kyoto… But still, I felt compelled. We found a single small stall selling horse fiddles, and I selected a beautifully decorated one that I wanted to take home. They had no case to carry the fiddle, but they gave us the name of a music store in the city which sells instrument cases for horse fiddles. It had started to rain and the black market was closing down. We hurried to see the section selling gers and the traditional furniture that is used in the gers. Since this is mostly an outdoor market, the vendors selling gers kept them packed into containers that looked like large shipping containers, each seller offering different designs, with varying prices and differing quality. Most of the gers were extremely affordable, selling for as little as $1700 to $3000, including two layers of felt and an outer layer of waterproof canvas. For many Mongolians, these gers are used as permanent homes. I could not help but think of all the people in our society who mortgage themselves for life, in order to own a house. There is a new movement in the USA where people decide to live in tiny spaces, learning to live with less, inexpensively building their own homes by themselves. If the homes are tiny enough, you do not even need any building permits. Still, these tiny homes, with so little space in which to move about, cost about $18,000-$25,000 to build. 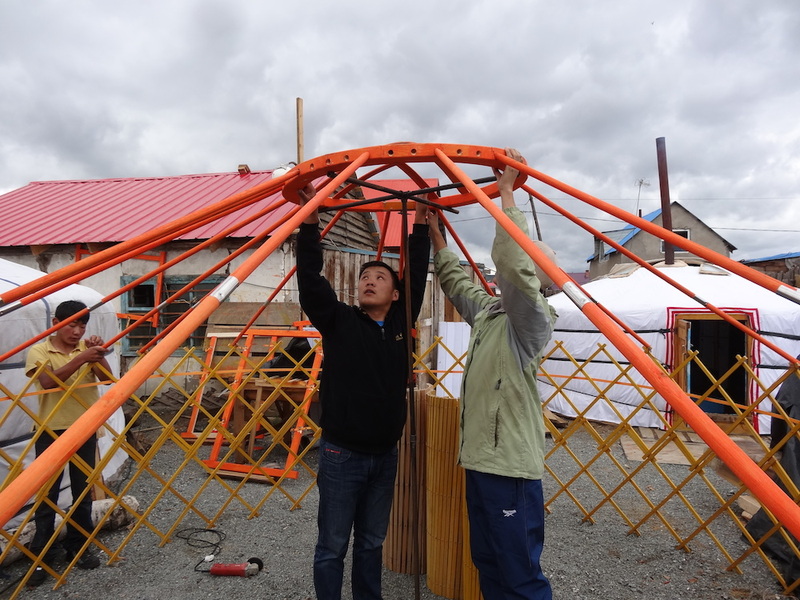 If I had few resources, I would rather buy a beautiful piece of land and erect one of those beautiful Mongolian-style yurts on it for as little as a few thousand dollars. The yurts are so much more spacious than any of the tiny houses. (If you are curious, there are a few documentaries about people living in tiny homes. Of course, shipping a ger overseas, and the customs fees associated with it, would more than double its cost, and there are plenty of vendors in the USA and UK who sell Mongolian gers and deal with the shipping and customs costs for you. After the market, we hurried to buy a fiddle carrying case before the music store closed. I selected one which I liked because it had straps that enabled it to be a backpack. We spent our last meal in Mongolia with Tuya, our friend and our wonderful guide, eating delicious food at leisure at the Kempinski Hotel. “Once there was a young man who was called into the army. He was stationed in a very remote part of Western Mongolia. Since he came from a family of horsemen, he was assigned to care for the horses of the general at his army post. The ruler of the region had a beautiful daughter, and soon the young man and the girl fell deeply in love with each other. Her father, not at all excited by this romance, forbade his daughter from seeing the boy. They continued to meet in secret, vowing to never love anyone else but each other. Alas, the young man finished his army service and the ruler demanded that he return to his home town. Sad beyond words, he met with the girl for the last time and told her of his predicament. The girl laughed, whistled a short tune, and in answer to her calling, a beautiful white horse came trotting toward them. When the boy mounted the horse, the girl made him promise to come to her every night. The boy promised to do so, telling her that if at any point he did not come, it could only mean that he had died; otherwise, he will come, rain or shine. For three happy months, the couple reunited every night, with the help of the magical flying horse. One day, a curious neighbor approached the boy and demanded to know where he was spending all of his nights. The boy did not wish to reveal his nightly soirées, and dismissed the man, telling him to mind his own business. Angry, the neighbor hid one night to spy on the boy. He saw the boy mount his white horse, and to his astonishment, the white horse spread its hidden, folded wings and flew into the sky, the boy on its back. The next day, the neighbor took a sharp knife and cut the wings of the magical horse. The beautiful animal bled to death, and when the boy came and saw his beloved horse dead, his sadness knew no bounds. The boy cried inconsolably for days. One night, the spirit of the horse came to him in a dream and asked him to cut some hair from the dead horse’s tail and mane. In his wandering in the woods, the boy found a piece of wood and carved it into the shape of the head of his beautiful horse. From another piece of wood, he made a simple box and created a rustic fiddle with his horse head carving as the neck and the horse hairs as the strings. He also made a bow from the horse’s hair. To his delight and surprise, the musical notes that came out of this rustic instrument were rich and sweet. Later at midnight as our plane rose above the lights of Ulaanbaatar, I felt a pang of sadness in my heart to be leaving…. Yes, I was craving good food and the beauty of Japan, which I love, but there was something about the green pastoral land of Mongolia and its friendly people, that I will always carry in my heart….